Algorithmic trading has grown increasingly popular in recent years as computer processing costs have fallen and the ability to automatically place transactions in just a fraction of a second has become commonplace. Rather than having analysts pouring over news feeds or charts to decide on a trading strategy as events unfold, complex algorithms are now widely deployed – the parameters are set in advance and the computer simply executes the appropriate trade as the events unfold. It’s worth adding that this isn’t all about High Frequency Trading (HFT) where some look to repeatedly book small profits on thousands of trades every day. Automated trading strategies can equally be used to de-risk positions as significant events are unfolding, be those fundamental factors such as a profit warning or economic release, or even as a reaction to technical levels being breached. Institutions and even private investors will expend a great deal of resource on ensuring they have an automated strategy that works. Rigorous back-testing is perfectly normal to ensure that the winning trades outnumber the losing ones, but it is a widely accepted fact in finance that without diversification, you run some significant risks. No fund manager would ever have a portfolio consisting of just one stock, so in exactly the same way, algorithmic traders should always be running multiple trading systems at the same time with exposure to multiple instruments. This offers the assurance that if one ‘algo’ fails due to some unexpected circumstance, the portfolio as a whole still has value and you can continue to trade. This is all sound thinking when you are using physical assets, but if you are looking to trade on a leveraged basis then it presents some unique challenges. Leveraged trading is very common, especially when physical delivery of the assets isn’t required. It is also useful for shorter term trading strategies as transaction costs are invariably lower. It sees the investor putting down a small percentage of the trade value as collateral with the ability to get far more exposure to the asset, further improving the potential return on investment. However, when taking this approach, an investor or money manager has to ensure they have sufficient free margin available for all of the trading strategies, which are in play at any one time, to draw on when the need arises. Each individual asset will be controlled by a bespoke algorithm, but you always need to have sufficient space for draw down if one – or more – aspects of the portfolio aren’t performing as you had planned. So herein lies the dilemma – leverage is hugely useful for allowing the investor to work their available cash harder, but if that same investor needs to leave hefty tranches of cash on deposit with the broker just incase it’s required for a draw down, then the very benefit that leverage affords is eroded. Once you add diversification into the equation, it becomes even more complicated. Unless investors can find a way to simultaneously back-test multiple trading strategies against a single cash account, then trying to decide just how much margin is required across a diversified, algo-based trading strategy – or alternatively how to go about optimizing such as strategy given the cash that’s available – has until now been impossible. Companies such as Seer Trading have however been working to find a solution to this challenge and they have now developed an institutional grade algorithmic trading platform that is being used by a number of banks and proprietary trading houses for multi asset and cross asset trading algorithms. This evolution in the testing and management of algorithmic trading is seen as pushing institutions, money managers and private investors one step closer to the goal of consistently achieving superior returns while minimizing risk. Key to this has been the ability to display the results of the back-testing in a three dimensional heat-map, allowing the likely problem areas to be identified at a glance. Ultimately the idea is that the money manager should be able to re-work the strategies in play to remove this risk, rather than simply having to increase the cash held in the fund. 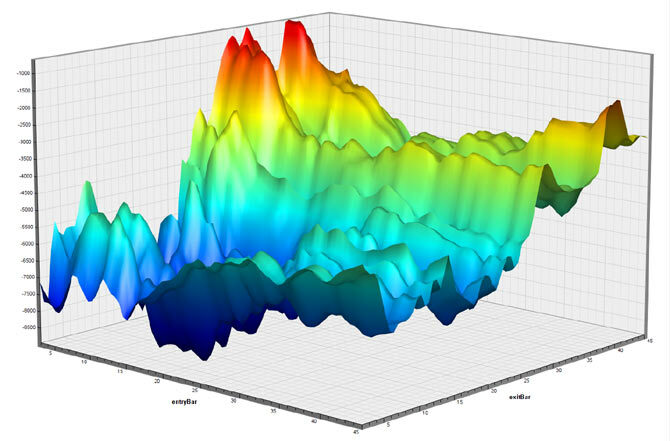 A visualization screen from Seer Trading, showing were the potential draw-down risks lie in a diversified algorithmic trading strategy. Of course regardless of how sophisticated or robust the back-testing process is, the ultimate success of the trading strategy will invariably come back to just how intelligent the algorithm is. As computing costs continue to fall and processing speeds increase, the statistical programmers and quant analysts will go on being able to refine their models, predicting future price behaviour with ever- increasing accuracy. There is little doubt that this is where the battle for alpha returns will be fought in the months and years that lie ahead. Ilan Azbel is a Director at Seer Trading (www.seertrading.com). He has over 15 years of experience in the field of technology, over 10 years experience in financial markets, and an academic background in mathematics and computer science. Ilan is a key strategist and visionary for the growth and success of companies which he becomes involved in. He founded Autochartist in 2003 which has become one of the most popular automated pattern recognition solutions for retail traders worldwide and is looking to replicate this success with Seer Trading.